Failure is inevitable and a postmortem analysis, conducted in an open, blameless way, is the best way for IT techs and managers to learn from outages and near-misses. But when the "root cause" is determined to be "human error" (or worse, particular humans), the real causes and conditions are lost. 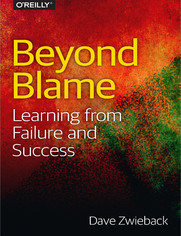 In this insightful book, IT veteran Dave Zwieback shows you an approach for making postmortems blameless, so you can focus instead on addressing areas of fragility within systems and organizations. If you...re involved with assessing why something goes wrong on a project or at your company-as a system administrator, developer, team manager, or executive-the concrete steps in this guide will help you find a real solution that works.